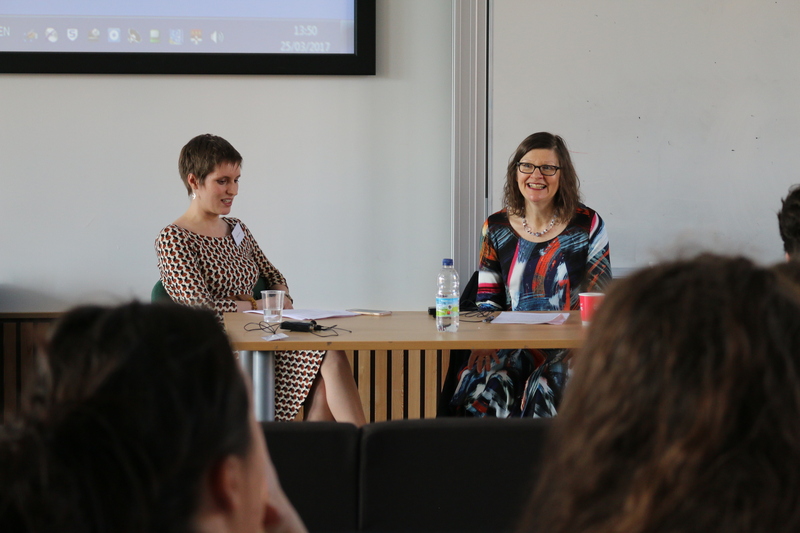 Dr Bethany Layne and I would like to express our sincere thanks to our undergraduate and postgraduate students who helped us organise the ‘Postmodernist Biofictions’ conference in the Department on Saturday 25th March, as well as to all our students who came along to support it. The conference grew out of our work on our research-led Part 3 modules and the positivity that we received from our students was extraordinary. Eight undergraduate students worked with us on event organisation; they took photographs, managed the digital equipment, publicised the event, and oversaw logistical detail. They also led the Twitter feed from the conference (the comments on the feed are a joy). Three of our Part 3 students (Chloe de Lullington, Dan Buckingham and Claire Timmerman) agreed to take part in a student panel at the conference and we were delighted to see that our keynote delegates, including Professor David Lodge, Professor Susan Sellers, Professor Maggie Gee, Professor Coral Ann Howells, Professor David Brauner, and Professor Patrick Parrinder expressed a keen desire to hear their papers. All commented on the sophistication of their work and on the professional confidence with which they delivered their academic papers. 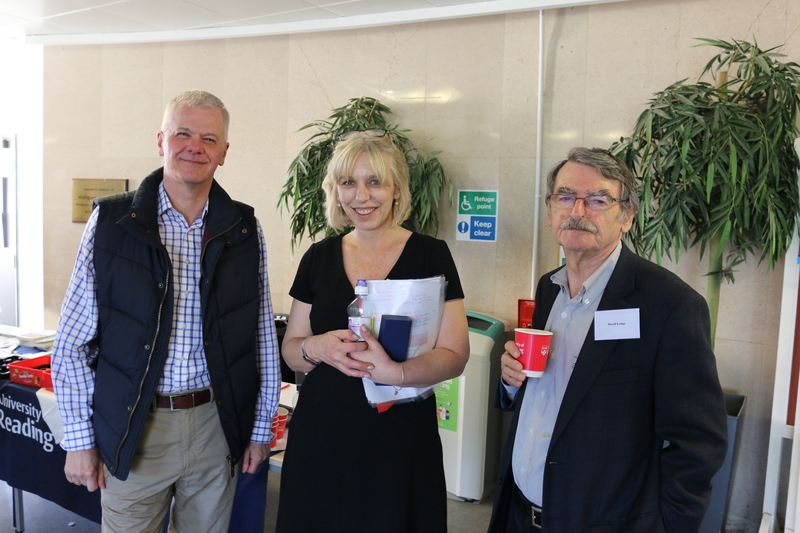 Several delegates (including Professor Sellers) mentioned how impressed they were that the Department could produce such outstanding contributions from undergraduate students. Chloe and Dan were central to the planning and detail of the conference, and Part 2 students Jack Champion and Vicky Matthews were also essential to the event. Jack is writing about the event for ‘Spark’ and Vicky took our photographs for us. 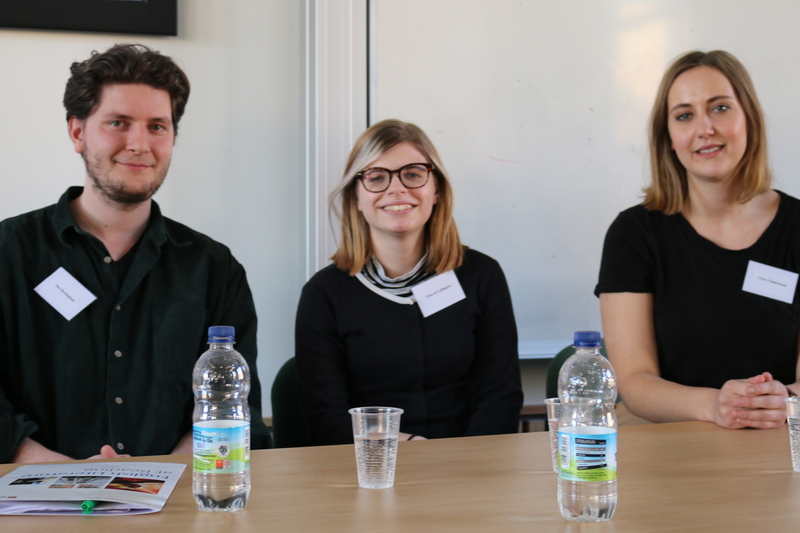 Part 3 student Ruth Williams helped us with advertising via social media, and PhD student Will Davies chaired a panel for us. These students’ involvement was a tribute to their personal confidence and it also demonstrated their critical engagement with the material they had studied with us. Their advanced thinking expressed the ‘mastery of the discipline’ and the ‘skills in research and enquiry’ lying at the heart of our teaching principles. Our collaborative values were demonstrated by the Vice-Chancellor’s attendance at the afternoon sessions of the Conference. Sir David Bell chatted with our students about their work, and his support of Dr Layne and I spoke to our leadership’s commitment to collaborative knowledge sharing and to the development of productive, inclusive relationships. To all who attended the event, thank you for all your hard work and for being such fine ambassadors for our department. Any student who would like to help us with the organisation of the student and public-facing Jess Phillips MP talk on June 1st, please contact me (m.k.davies@reading.ac.uk). 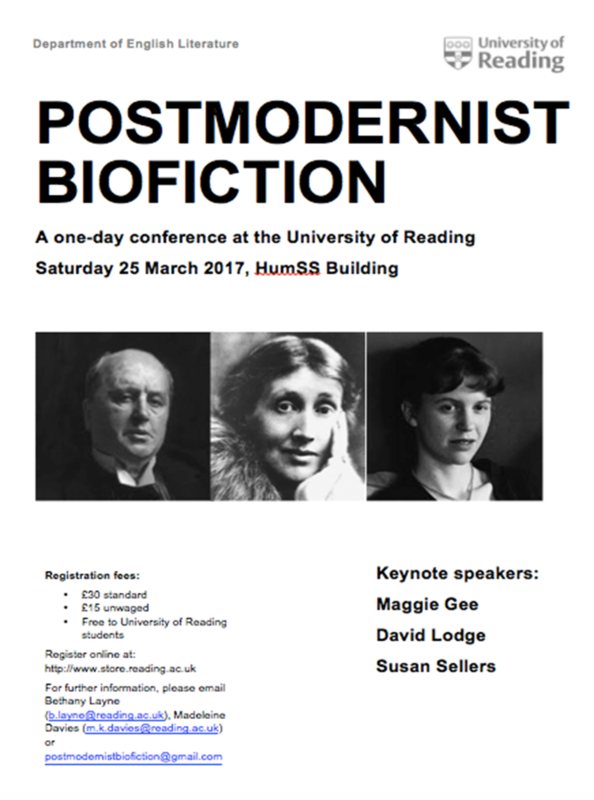 We would also be very grateful for help with the International Virginia Woolf conference to be hosted at UofR at the end of June/early July. This entry was posted in Department of English Literature news and events and tagged Chloe de Lullington, Claire Timmerman, Dan Buckingham, Department of English, Department of English Literature, Dr Bethany Layne, Dr Madeleine Davies, English Department, English Literature, Jack Champion, Postmodernist Biofiction, Reading, University of Reading, Vicky Matthews. Bookmark the permalink.